This feature allows you to forward any email address @yourdomain.com to any email address you choose, for example a hotmail or yahoo.com address. You can forward each address to up to three different addresses. 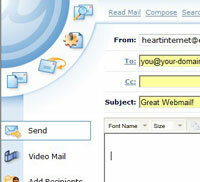 This feature allows you to forward all email from yourdomain.com to any email address you choose, for example a hotmail or yahoo.com address. Note that if you have any individual email forwarding accounts setup they will be processed instead of your catch-all email. You can create as many folders as you need to easily store and organise your mail. This handy feature allows you to manage appointments (tasks) on a quarterly, annual, or daily basis. Microsoft Outlook can be synchronized with your Webmail account so that contacts and scheduler data can be shared between a desktop and Webmail client. If a user adds a new appointment (task) or contact while using Outlook or Webmail, the data will be automatically synchronised between the applications. Webmail's enhanced address book functionality allows you to import and export contacts from/to CSV (comma separated values) file format. 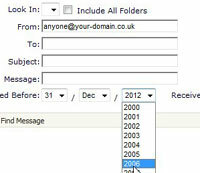 You can also sync your Webmail account with your existing address-books. Spell check your email before sending it using the built in spell checker with a new and updated language database. Messages contained in your Inbox can be sorted by subject, date, or email address. 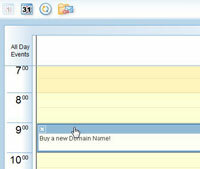 You can search your mailbox for keywords, allowing quick and easy access to your stored email. Create eye-catching emails using different fonts and colours or by embedding pictures and sounds. Why not add your company logo or a customised signature? You can easily attach files to your emails to send to friends, family or colleagues. Create rules to move specific messages or block unwanted senders altogether. Webmail is one of our most popular features and we operate our Webmail system on a sophisticated hardware platform. This uses state-of-the-art hardware load balancers to distribute traffic to our cluster of Webmail servers. Your messages are centrally stored on giant disk arrays and backed up each day, first to another disk array and then to tape which is stored offsite.